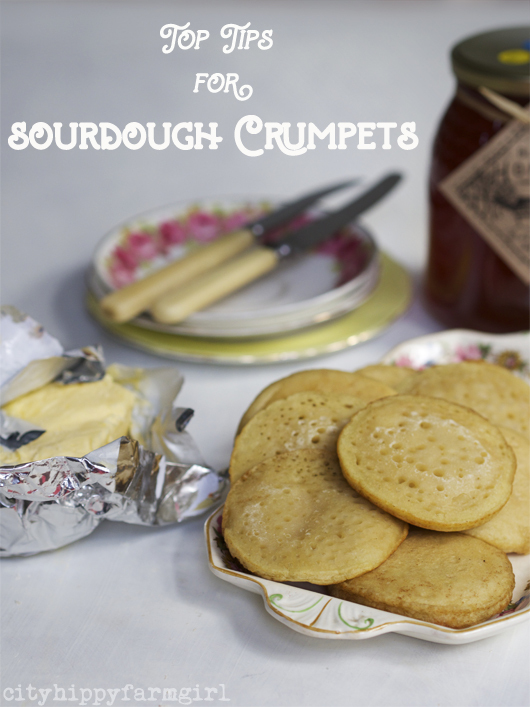 This entry was posted in Baking Bread, Food Glorious Food, Making, Creating + Frugal Living and tagged best crumpet recipe, crumpets, easy baking, extra sourdough starter, frugal, how to make sourdough crumpets, sourdough crumpets, top tips for sourdough crumpets by cityhippyfarmgirl. Bookmark the permalink. Doing the sourdough bread is a great goal Sara, as for crumpets? an easy addition once you have the starter! Brydie, they look fabulous! I’ve made yeasted ones but not sourdough – thanks for the recipe! 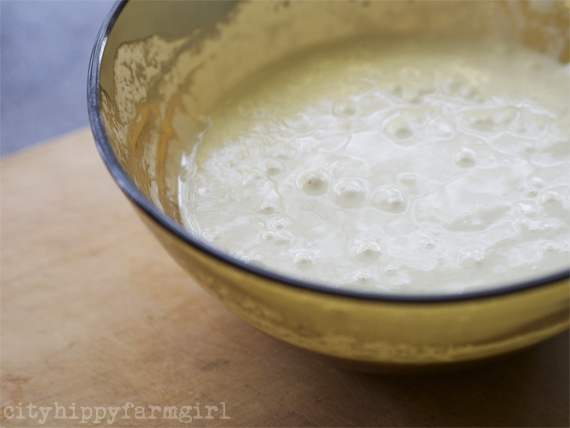 Mmmm – delicious Brydie – I love the idea of using sourdough – thansks. So much easier on the belly than regular yeasted ones Rachel. Sounds like a crumpet triumph. Yumness! Just having two rings will sort you out Johanna. Jane they aren’t particularly quick (well not when I only have two egg rings) but they do taste quite ok. I wonder if you can do them in your wood stove oven? Artisan Wood Fired Sourdough Crumpets….how hipster does that sound! I’ve never had a crumpet, but these look good! I’ll have to try. Ms Narfy I read that twice as you crack me up and you always put a smile on my face with your comments. Bastardising classics is something that I have been known to do at times, so I’m glad I didn’t let you down in this regard. Just made them!!! So easy and tasty!! Thanks Brydie! Also great with golden syrup! I’m a newbie to sour dough so its great to already have another use for my starter! I can’t believe they’re that easy! And I’ve always got extra starter hanging around…well that’s breakfast Friday when I’ll be hanging about with the kiddos 🙂 Is this roughly a 100% starter? These look fabulous! I’m adding them to my repertoire of “things to do with my sourdough starter”. Thanks for sharing! Swap honey for golden syrup and you got me! I can feel my waistline expanding as I read! I love a good crumpet, and this recipe seems so straight forward. I’ll make them as a reward for myself once i get the hang of the bread. Thanks for sharing the recipe! You know what the excellent part of sourdough is Tracey? It’s always a far lower glycaemic index, so you feel fuller quicker and it lasts longer as fuel for body. Your waistline will be fine, promise! 🙂 It’s the store bought crumpets you have to quietly step away from.